Jack Kirby earned his nickname. The man known as the King of Comics drew incredibly fast, incredibly well and with incredible imagination. He had a hand in creating many of Marvel Comics’ most well-loved characters—including Iron Man, Thor, the Hulk, and others—did ground-brealing work at DC Comics and also drew comics in the romance, Western and monster genres, too. And because Kirby helped draw concepts for the fictional movie that helped free American diplomats 1980, he makes a cameo appearance in Oscar-wining movie Argo, too. Kings inspire devotion. And collector Vincent Ladevaia is super-devoted to Kirby. He’s been tracking down and buying comics with covers by the master artist for the last few years. After coming across his Tumblr, I decided to ask Iadevaia about his love for one of comics’ great masters. Kotaku: Do you know the actual number of covers Jack Kirby illustrated? From 1938 up until his death in 1994, Kirby produced at least 1526 comic book covers. The Jack Kirby Checklist is the most complete list I’ve come across and I don’t leave home without it! It does an amazing job of documenting Kirby’s career in detail, including small details like the amount of pages he drew in a particular issue. Kotaku: Are you going for EVERYTHING everything that Kirby drew a cover for, including the romance and western material? Or are you just sticking to superhero stuff? My original goal was to collect Jack Kirby’s run on The Fantastic Four, issues #1-101, but it’s turned into collecting everything. When I’m digging through boxes of vintage books at my local comic book store, it’s really tough to put down anything Kirby created. There’s some sort of cosmic energy in his work that always attracts me. 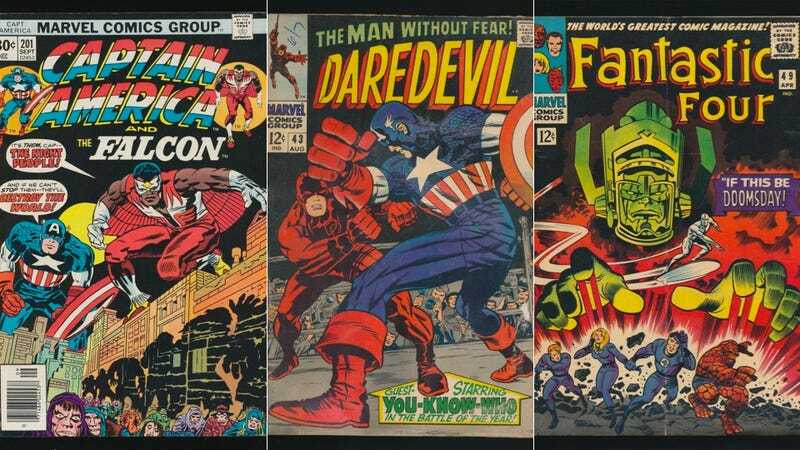 Recently I’ve become really interested in his early work at Timely Comics where he created Captain America with partner Joe Simon, but those books aren’t exactly affordable. Kotaku: How do you feel about the fact that Kirby’s creative legacy barely gets acknowledged by the massive Marvel Entertainment machine now? It’s really sad to watch Marvel Comics make billions off of Jack Kirby’s creations without giving him and his estate any credit or royalties. Among many others, Kirby created Thor, The X-Men, Iron Man, and The Fantastic Four. I can’t imagine a Marvel Comics without him and the publisher should be be embarrassed of how they treated Kirby. Kotaku: If you had to pick an interior page sequence by Kirby to spend imaginary money on, which one would it be? Why this particular one above all others? This was a tough decision. I would pick this interior page from Fantastic Four #51. The use of collage to represent the negative zone in the series was ahead of its time, showing readers that comics could be seen as fine art. The page represents Jack’s forward-thinking ideas that pushed comic books as a medium.